Porcelaine 150 can be applied to all heat-stable bases that are able to withstand a temperature of 150°C (300°F), such as porcelain, china, glazed earthenware, terracotta, metal, enamelled sheet steel, copper and glass. Excellent light stability. Cleaning of brushes is with soapy water. Drying is tack free in a few minutes, fully dry in a minimum of 24 hours. Baking of all colours and auxiliary products in the range takes 35 minutes at 150°C (300°F) in domestic oven, after minimum 24 hours drying. 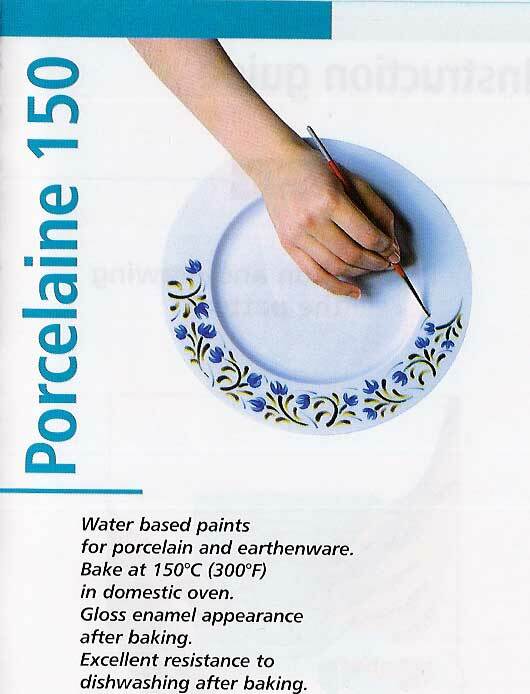 Porcelaine 150 can be applied to all heat-stable bases that are able to withstand a temperature of 150°C (300°F) in a domestic oven, such as porcelain, china, glazed earthenware, terracotta, metal, enamelled sheet steel, copper and glass. Cleaning of brushes is with soapy water. Drying is tack free in a few minutes, fully dry in a minimum of 24 hours. All colours and auxiliary products in the range have remarkable resistance to dishwashing and to normal detergents after baking. Store the markers horizontal flat. Conforms to toy safety standard 71.3. Many applications are possible with Porcelaine 150 with brushes and also with > sponge, stencil... 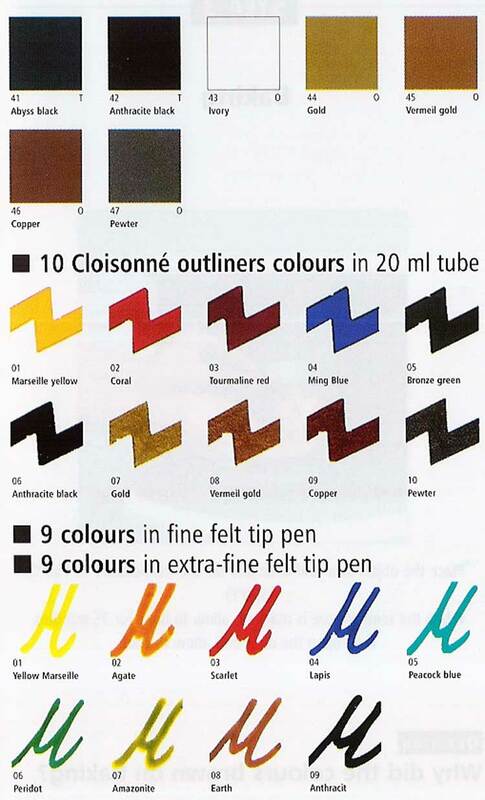 The Porcelaine 150 outliners, in tube with nozzle, can be used for outlining work. The markers are recommended for lines and writing. On which surface can Porcelaine 150 be applied ? How to prepare the surface to be painted ? Simply clean thoroughly the surface with soapy water or alcohol. 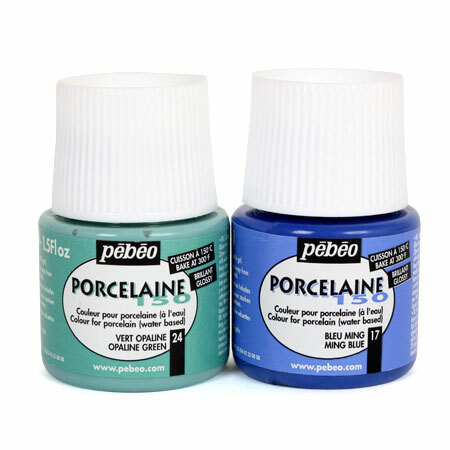 Can I paint with Porcelaine 150 on porous objects, such as plaster or earthenware ? Yes, it is possible to paint on slightly porous objects. After a light sanding, apply a coat of filler undercoat. Allow to dry for 24 hours, then apply the paint. Before baking, it is very simple. The colours can be removed with water or alcohol: use a damp cotton swab to correct a detail or soak your object in water for a few minutes to erase everything. Why did the colours brown after baking ? The baking time was too long or the oven temperature was too high: use a special thermometer available from Pébéo (available in the Porcelaine 150 range). How can I obtain very transparent colours ? Mix them with the gloss medium. 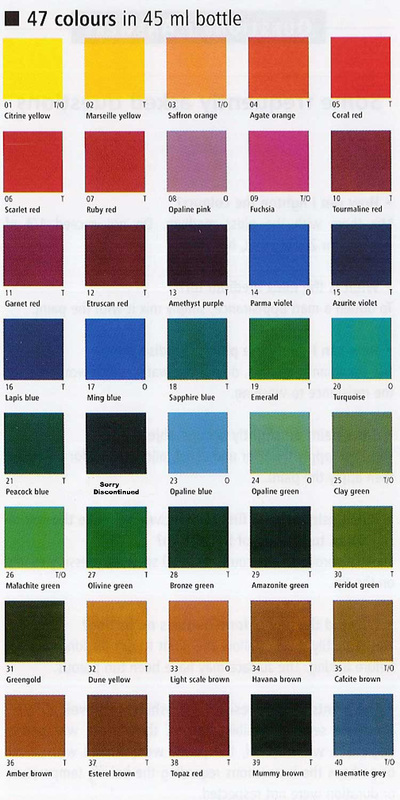 Do not exceed 1/3 of medium for 2/3 of paint, however. What is the matt medium for ? To obtain a matt appearance ; simply mix it with the paint. How can I dilute the paints, fluidize them ? With the Porcelaine 150 thinner. Caution, do not use water which would reduce the resistance to washing. Why did the paints form bubbles after baking ? You probably did not allow the paint to dry long enough before baking. The surface may have been too porous. The paints did not resist dishwashing very well. Why ? There are several possible reasons: the surface was poorly degreased with alcohol, the paints were diluted with water or perhaps the instructions regarding the baking temperature or duration were not respected. When using for the first time, how do I make the colour run down to the end of the felt tip marker ? Shake vigorously, then count 30 to 60 seconds, pressing evenly on the tip. 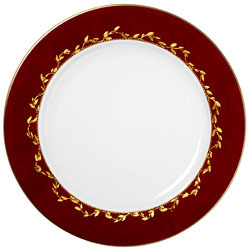 Porcelaine 150 : Etruscan red 12.
auxiliary product : Gold Porcelaine 150 outliner 07.
brush: medium size foam brush. Wash your plate with soapy water to degrease it. Stir the red paint and apply it, using a foam brush, on the rim of the plate. 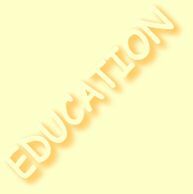 If you are not satisfied with the result, you can always wash your design before it dries. Allow to dry for 24 hours, then draw free hand, directly with the nozzle of the tube, a garland of small golden leaves. Allow to dry for 24 hours. Then place your piece in a cold kitchen oven. Set the temperature at 150°C or 300°F. Once the temperature has been reached (use an oven thermometer to verify the temperature), bake for 35 minutes. Then, turn off the oven, open the door and allow to cool. Once baked, your plate will be dishwasher safe. Extra fine felt tip is 1 mm and large is 2 mm approx.